I have been fascinated by hares for many years. Having an interest in legends and spiritual matters the stories and symbolism that surrounds these creatures continues to inspire me. Through the centuries the hare has been a symbol of the cycle of nature and renewal in cultures all over the world. The hare may be a trickster or a fast creative thinker. They have been known to be connected with witches or to be enchanted. The more I read and research the more they appear in different contexts and with different significances. 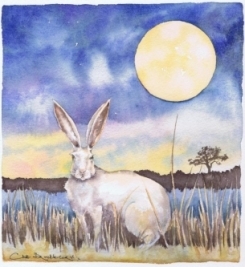 In 2009 I painted a picture of a white hare in the moonlight. There are legends surrounding white hares. Sometimes they haunt the breaker of a woman's heart, sometimes they will steal your soul away if you meet them at night. Another has the white hare appearing to warn fishermen in the south west of storms at sea. It was this last story that inspired my first book Assander; the White Hare of Hartland that you can read about on another dedicated page. Below are some of my paintings of hares. All are available as prints, use the Prints for Sale button on the right for more information and to buy online.